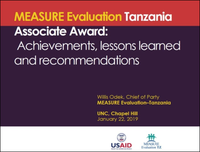 The five-year MEASURE Evaluation–Tanzania (MEval–Tanzania) Associate Award began in February 2014 and ends in September 2019. The project is funded by the United States Agency for International Development (USAID), the United States President’s Emergency Plan for AIDS Relief (PEPFAR), and the President’s Malaria Initiative (PMI). The aim is to strengthen monitoring and evaluation (M&E) and research capacity of community health and social service programs in the United Republic of Tanzania for malaria and HIV control programs in Mainland Tanzania and Zanzibar. Result 1: Policy makers use quality data to develop policies and guidelines, and advocate for community health and social service programs. Result 2: Quality data routinely used by local governments, community providers and facilities to improve program planning, budgeting and program implementation. Result 3: Increased evidence base for community health and social service. The project seeks to build the evidence base for its work from evaluation, monitoring, and focused research and to use this evidence to develop health policies and guidelines, advocate for needed programs, and provide for fact-based planning, budgeting, and implementation for the national and subnational levels. Most vulnerable children: Improving the M&E plan and data management system for MVC through better data quality, reduced system fragmentation, and enhanced system flexibility and sustainability, and by developing a national guideline for supervising MVC programmes using the system. Health information systems: Supporting opportunities for regular data reviews of data quality and performance of health indicators for malaria and HIV, to identify gaps in data and services, and to develop action plans to address those gaps. Malaria: Supporting seven operations research studies on aspects of malaria surveillance and vector control, such as school bed-net distribution programmes, a holed nets study, and malaria case notification, among others. Research and M&E: Developing in collaboration with Muhimbili University of Health and Allied Sciences (MUHAS) a postgraduate master’s degree programme in project management and M&E in health which is in its second year and has high demand.